H No. 2 U.S. Coast Survey Horn Island Pass Mississippi Sound. A rare hand colored 1853 costal chart of the Horn Island Pass. Horn Island pass is the entrance to the Mississippi Sound and thence the Pascagoula River from the Gulf of Mexico. 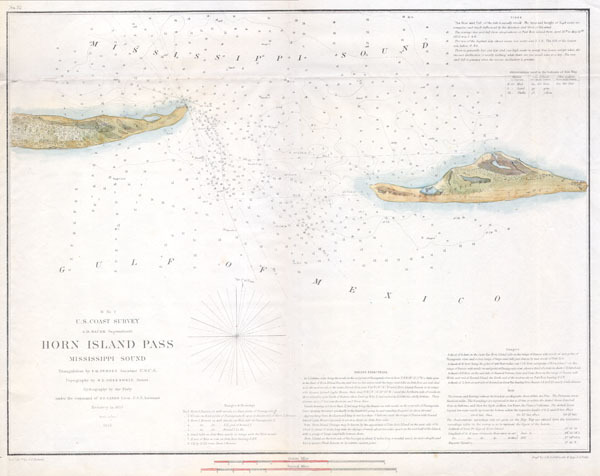 Depicts Horn Island and the western part of Petit Bois Island. Chart features numerous depth soundings and detailed sailing instructions. The Triangulation was accomplished by F. H. Gerdes and the Topography by W.E. Greenwell. Both men produced this chart under the command of B.F. Sands. Published under the supervision of A. D. Bache for the 1853 Report of the Superintendant of the U.S. Coast Survey.